Learn how to use Highster Mobile tracking software to keep your children safe. Highster Mobile is a mobile phone spy and tracking software that allows you to safely monitor your children and your employees. The cell phone monitoring software allows you to remotely access text messages, GPS location, call logs, social media messages and more. As a parent, ensuring the safety of your children is one of your greatest concerns. These days, once children and even teens become active in the online world, they become potential targets of bullies, pedophiles, activist groups and even terrorists. This product allows you to covertly monitor their web browsing activity, SMS text messages and other communications. Knowing exactly what your children are doing online means you can intervene when they need help. Online bullying has become such a huge problem in this country because it largely takes place outside of the view of parents and teachers. This tool allows you to help prevent it from happening. As a business owner, you may have the right to monitor employee activity on company-issued mobile devices. Companies often clearly state in their information security policy that employees should have no expectation of privacy when using company-issued electronics such as laptops, tablets and cell phones. Installing Highster Mobile will help you keep track of their activity when they are on the job. Let’s face it, employees will often slack off and use their phones for inappropriate reasons, such as chatting with friends, surfing inappropriate websites, and sending personal emails. Find out what their up to with this easy to use product. Keep your employees on their toes and reduce unwanted, non-business activity. All you have to do is text or email a link to the target device. Then, download and install the app. Once you install the app, activate the app using the license that is provided at purchase. Activate the app and enter the phone number of the device you wish to monitor. Finally, login to your online account to view the info that is covertly uploaded by the device. The software works on iPhones and iPads. Capture iMessages, text messages, calls, Facebook IM’s, photos, videos, GPS location and more. In addition, the program works with Android devices. On Androids, it captures texts, calls, GPS location, photos, videos, Facebook messages and much more from popular Android devices like; Samsung, Motorola, HTC, Google, LG and more. 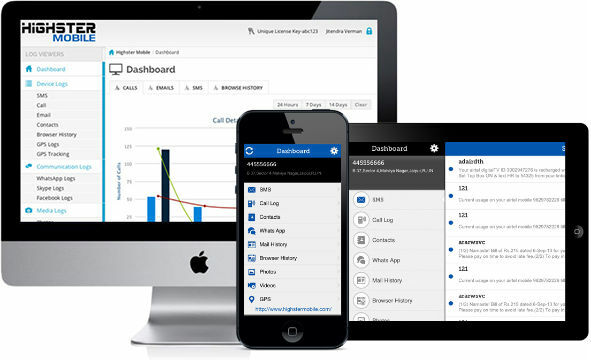 Cell phone monitoring software for 1 Android device, or 1 iPhone iPad device is $69.99. Highster Mobile is one of the best mobile phone spy products due to its broad set of features and functionality and value for the money. In addition, we give their product a high rating for ease-of-use and technical support. If you need to learn more about the product, visit the Highster Mobile website at https://highstermobile.com/. After you buy Highster Mobile you will receive your Confirmation email which contains your download link, username, password and license key. It includes easy-to-follow instructions complete with full illustrations clearly explaining how to install the app. If you run into any trouble you can contact our Support Department for help and they will be happy to assist you. About the Company: The Highster Mobile product is developed by ILF Mobile Apps Corp. The company is located at 80 Orville Drive, Bohemia New York, 11716. For more information on the company, please visit their primary website at www.ilfmobileapps.com. If you have questions, please contact the company directly at Phone: 1(866) 611-9506. Important Product Disclaimer: Device requirements: Physical access to the target phone for approximately 2-3 minutes is required except for Non-Jailbreak version. Apple ID and password is necessary for Non-Jailbreak version. It is the responsibility of the end user to comply with all federal and state laws. Cell Phone Spy software will allow you to monitor mobile phones as a tool NOT for illegal purposes. Use at your discretion. If you have any questions, comments or feedback on Highster Mobile please post a message below. Also, see our reviews of other cell phone spyware, including the industry-leading solution, mSpy.